Wall hung WC suite with horizontal outlet. Round or square seat options to match washbasins. 6/ 4 L dual flush, lever action. 6/ 4 L dual flush, push button action. For lever action cistern only. Air button, dual flush, small button, chrome plated. For 3-40 mm panel depth. Air button, dual flush, plastic large plate 150 x 230 mm chrome plated. Minimum 75 mm panel depth. Air button, dual flush, mini plate 80 x 124 mm chrome plated. Minimum 65 mm panel depth. 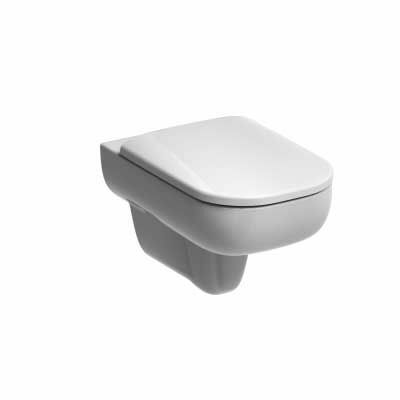 Flushsense infra-red sensor, 100 mm diameter, chrome plated. Round, top fix, standard hinges. Round, soft close mechanism, standard hinges. Square, top fix, standard hinges. Square, soft close mechanism, standard hinges.